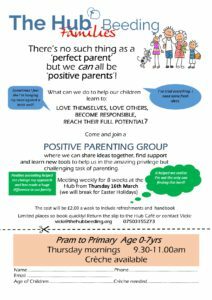 A great opportunity to share parenting trials and triumphs with others in the same boat! We watch a ten minute DVD and discuss together the ideas it suggests and how they may work in our own family situations. Starting Thursday March 16th. Places limited so book yours quickly! I am also looking at running groups for families with older children in an evening. The principals for both groups are exactly same but the examples and practical suggestions given will be age appropriate for Children between 5 and 12 years old. Do get in touch if you are interested.